By Sherman Farralone, Quilt staff. 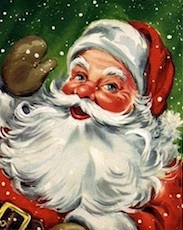 Santa Claus — the right jolly old elf who delivers toys to good little girls and boys all over the world on Christmas Eve — has been hospitalized in critical condition at Northridge Hospital Medical Center, suffering from third degree burns to 90% of his trademark red suit after being struck mid-air by an explosive projectile over Canoga Park last night. in Canoga Park last night, landing in an alley just south of Valerio Street. Image: Google. All of his eight tiny reindeer suffered injuries as well, ranging from singed hooves and broken antlers to massive internal injuries, according to a spokesperson with LA Animal Services. Two of them, Dasher and Comet, had to be euthanized on the spot. “I got a frantic call from [Santa] on the two-way radio,” says Santa’s Workshop head elf Jingle. “He was sure his GPS wasn’t working properly. We told him our tracking showed him over Canoga Park. He said that’s what his screen read but that it looked like some sort of war zone. He was certain he was somewhere in the Middle East, rather than what he said he remembered as a quiet San Fernando Valley community. Santa Claus in an undated photo. Capt. Reed Malloy, Community Outreach Support Officer of the LAPD’s West Valley Bureau of Inexplicable Holiday Traditions notes that just around midnight, there was a marked increase in the usual amount of illegal fireworks being set off in Canoga Park. “Well, not a marked increase from what we usually experience on Christmas Eve, but a marked increase from, say, two days ago,” explains Malloy. 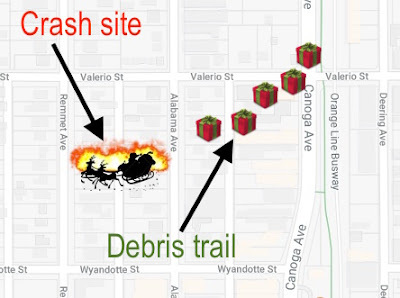 While it may be weeks before the FAA analyzes data from the sleigh's black box and releases a final report about the incident, an unnamed source close to the investigation is certain that one or more fireworks struck Santa's sleigh, while others exploding in the air nearby would have frightened and disoriented his team of reindeer, sending the aircraft crashing to the ground.